We can break this down into 3 separate sections: environmental, mechanical, and behavioral. The first is associated with the area around you. What are the limitations of the land? Mechanical refers to the components of the Sky Track and what can be done to get slack out of the line. What can you do if something breaks or you lose a component? The way your dog interacts with the Sky Track comprises the third category. "My puppy is freaking out! What do I do?" Let's investigate some of those solutions. 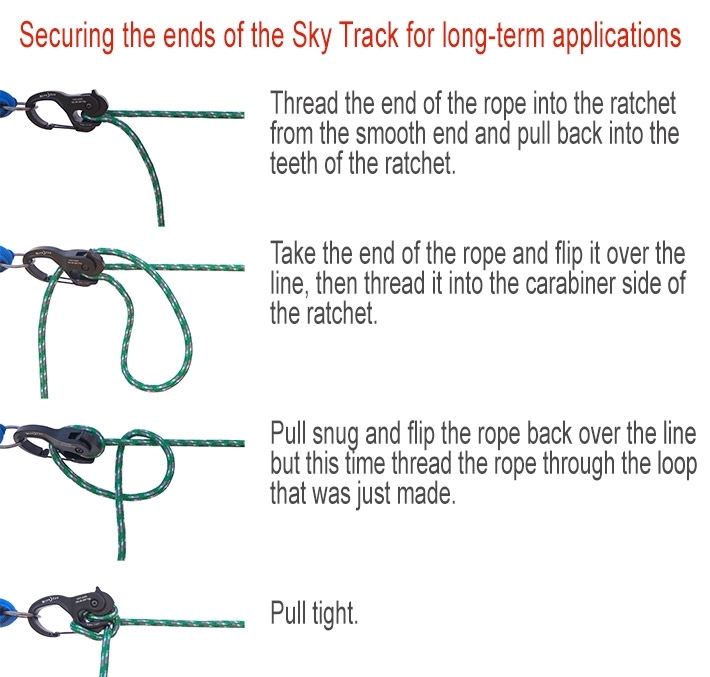 This first part of the Problem Solving page deal only with the Sky Track portable rope system. To get tips on the Cable system, click here to scroll to the bottom of the page. You can usually use the car bumper or roof rack to at least get part of the track above ground. Could you ask your neighbor politely to use anything on their site? Worst case scenario, you could use the line as a ground track if there isn't much danger for others in tripping over it. Of course, if trees are difficult to find, then your main concern should be finding shade. Redwoods have massive trunks. It would take a 15-foot strap to wrap around a 5-foot wide trunk. Wrap the rope around the tree and secure with the rope clamp. Alternately, carry extra rope with you and create a loop around the tree using a square knot to act as an anchor point. Did you look on the other side of the tree to find a broken branch or stub to hook the strap around? 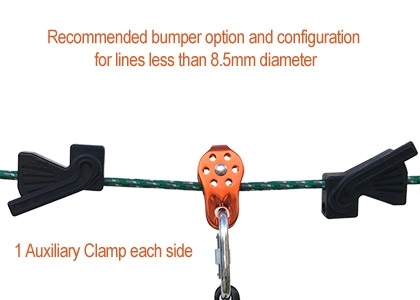 If there is nothing else nearby that can be used as an anchor and your car can't be moved closer to allow the roof or door to secure one end of the line, look for anything that can help you to lengthen the rope, like bungees, cord, tent straps, etc. Can you make a line between the picnic table and the car rack or bumper? Use a sheet bend knot to tie two ropes together of different diameters. We also sell a green/lavender rope for this purpose. If you already happen to have the yellow/red rope that we also sell, you could pick up a $5.00 of synthetic dye meant for nylon and polyester and follow the directions on the bottle. Use a diluted mixture of black to mute the color according to preference. Rit Dye More is a common brand sold at Michaels. The Line Tensioner helps keep the stack out of portable rope systems. Spray the Carabiner with a little oil if you live near the coast to protect from rusting. The pulley and ratchets are made of aluminum, but the carabiner is steel. Make sure the Bumpers are in full locked position. Align the padlock with the arrow icons. Leaving the bumpers in half lock positions may allow the rope to erode the plastic inner chamber, rendering its rope stop function useless. If this does happen, the Rope Clamp may be substituted. Rope is the most valuable component of the Sky Track. Keep the rope out of the sand and dirt if possible. Add a little oil to the ratchets, the pulley, and the carabiner screw every year or so to make sure all moving parts are well lubricated. Don't leave the Sky Track up all year if not in use. The weather and sun are strong destructive forces. Disconnect the rope from one end and once coiled, hang it from the other strap for temporary storage. Otherwise, it's always best to store in a dark, dry place. The blue Bumper doesn’t work. Solution: You may have not tightened it initially so that the padlock and arrow icons align. Replace it with the Rope Clamp if you have one or wrap and tie some rope onto the line. Contact us. The rope drags a little after the next day and requires some retightening. It only takes a couple of inches of stack for some rope drag to occur. All static lines will stretch up to 3% over time. Weather and temperature changes can exaccerbate the situation. Additionally, its a safety hazard to have a low hanging rope which can cause harm to unsuspecting passerbys. 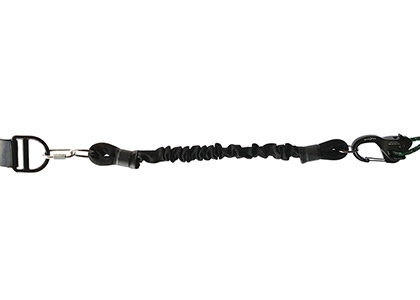 Solution A, 1 Line Tensioner - single strength: For lines less than 100 feet long, use one Line Tensioner on one side. Connect one Line Tensioner between an anchor point and the line ratchet. Additionally, one more Line Tensioner can be used on the other anchor as well to add extra stretch to the line. 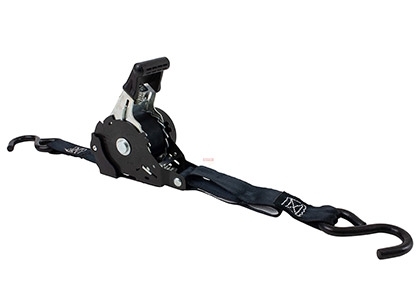 Solution B, 1 Folded Line Tensioner - single strength converted to double strength: To increase the strength of a single line tensioner in a pinch, double it by connecting both ends to the anchor strap D-ring and clip the RoverRoamer ratchet onto the middle of the Line Tensioner as shown. This is not ideal as it shortens the length of the bungee dramatically but it can work as a temporary solution. Solution C, 2 Line Tensioners - double strength: for lines over 100 feet long, use two Line Tensioners on one side in parallel. Connect two Line Tensioners side by side (in parallel) on one side to double the bungee strength. Additionally, for much longer lines, such as 200ft+, use two sets of parallel Line Tensioners. 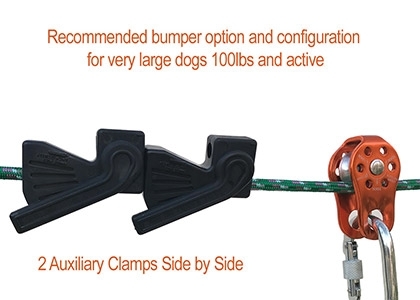 Solution D, Ratchet Straps - alone or in combination with Line Tensioners. Often, for less than $10 at your local hardware store, you can use a ratchet strap to tighten the line to a maximum degree. Be careful not to overtighten as these mechanical devices can apply over 2,000 lbs and will snap the RoverRoamer rope rachets. Use just enough pressure to tighten. We recommend using a ratchet strap in conjunction with parallel Line Tensioners. We don't recommend using a ratchet strap with just one Line Tensioner. 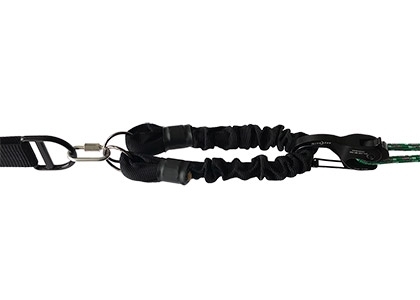 Wrap the ratchet strap around the same anchor point and connect to either the cable loop on the permanent cable system or the rope ratchet clip on the portable rope system. It is possible to sufficiently weatherize the rope system by implementing some additional steps and tips. Rain and ice during the winder months can add a few pounds to long lines. a) Add two Line Tensioners on one side by connecting both to a Anchor Strap D-ring. Make sure not to overtighten. Only allow the bungees to stretch just enough to tighten the line but no more than what is necessary. Make one side of the Track a den area complete with toys, blankets or towels with familiar smells, and a water dish. Make it comfy and pick out an area with shade or shelter. Initially, keep your dog on the Track for a limited amount of time until accustomed. Give them plenty of praise and offer a treat for good behavior. This is normal behavior for any dog trying to understand the situation. Are they trying to communicate something to you? Did you forget his favorite toy or a water dish? Does he bark when you leave him at home or shut the door? It's important to ignore the barking but also to reward him for not barking. Give him a chew toy to keep him busy and check in on him so he knows he's not left behind. Using a harness instead of a collar helps your dog to deflect attention away from the idea of being tied to something. 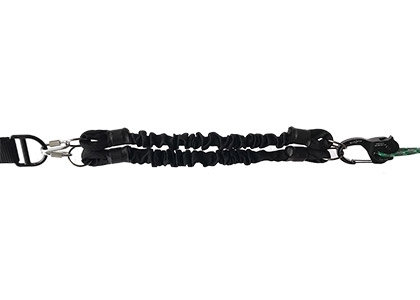 Try using a chain section under supervision to connect the harness or collar to the leash temporarily. Then switch it out and observe. Dogs have inherent stress about being bound, which is a survival instinct. Make sure they have plenty of water, treats, toys, and a cozy den so they can feel at home. What the Cable System acheives in all-weather situations, it lacks in portability. The most difficult aspect of setting up a cable system is getting the slack out of the line before employing the tensioners to maximize their function. The cable system requires more pressure onto the line due to the heavier weight of the cable verus the rope system so calculate about 50-100lbs of pressure. Without suitable trees or anchor points, you'll need to set a post 3ft into the ground and pour about 6" minimum of concrete around it. Ask you hardware professional for advice. Redwoods have massive trunks. It would take a 15-foot strap to wrap around a 5-foot wide trunk. Connect two anchor straps together to make one strap twice as long. Chain as many straps together as needed. There are still some things you can do to lengthen the cable line. Adding an extra cable line to each anchor point will give you up to 3.5 feet extra on each side. If that is still not enough, order additional line and create a loop on each side, connecting the two lines together. Email us and let us know the exact length you need. We will cut to your specifications. Remember to include about 1 extra foot for each side for the looping (2ft total). The cable saddles which act as bumpers can be replaced at a local hardware store or ordered on the replacement page. The Turnbuckle helps keep the stack out of portable rope systems and can be found at your local hardware store or on the replacement page. Don't leave the Cable system up all year if you're not going to use it for several months. The weather and sun are strong destructive forces. Disconnect the system for temporary storage. The vinyl coating on the cable will eventually fade and crack over years of use under harsh conditons. The system will still function but it won't be as quiet. The cable drags a little in the middle: It only takes a couple of inches of stack for the cable to appear to drag. Even temperature changes can lengthen or shorten the line slightly. Additionally, its a safety hazard to have a low hanging cable which can cause harm to unsuspecting passerbys. You will find it much easier to get the slack out of the cable line with some assistance. First, allow at least 1 foot of extra slack in the Anchor Straps before setting up the cable line section. This allows you to pull the slack out of the line after connecting the cable to the Anchor Straps. Make sure that you fully unscrew the turnbuckles to the maximum open position. Once you connect the cable to the Anchor Straps and pull the straps tight, you'll then tighten each turnbuckle to further tighten the line. If you're still having trouble, especially on your own, we recommend using a ratchet strap to pull the slack out. Wrap the ratchet strap around the same anchor point as you did with one of the Anchor Straps. Adjust the ratchet strap accordingly and connect one hook to the cable end loop. Ratchet the cable line until taut. Don't overtighten. Connect the turnbuckle(s) between the loop and the D-ring of the Anchor Strap, leaving plenty of room in the turnbuckle to tighten accordingly.